As a piece of literature, Dotter of Her Father’s Eyes may prove once and for all that graphic novels are actually a medium and not a genre. Part biography, part memoir, this erudite story revolves around author Mary Talbot and her complicated relationship with her parents. The main focus of the book is the parallel that Ms. Talbot draws of the relationship between her and her father, world renowned James Joyce scholar James S. Atherton, and that of James Joyce and his daughter Lucia. Though the actual parallels between the two daughters are subtle, the scholarly Mary clearly identifies with many of the gender struggles Lucia experienced more prominently in the 1920s and 30s, there is a shared sense of oppression, creative ambition, and familial angst. In fact many of these aspects are shown through the lens of her father’s scholarly acumen, particularly in the way he causally would work Joycean phrases into his everyday conversations (arguably solely for his own amusement). Though during the time of the author’s childhood, her father’s (seemingly OCD) scholarly pursuits were responsible (or were at least a symptom) of the rift between father and daughter, it is the very exploration of the life and works of James Joyce that allows us as readers to gain a deeper understanding of her father in a way a simple memoir could not. Ms. Talbot does not spare her audience the wealth of her education. As a member of the literati herself, she assumes a certain familiarity on behalf of the reader with the author in question, though readers unfamiliar with the works of Joyce are provided enough background and context to grasp the narrative Talbot creates. It is clear that like her father, for a time at least, she lived and breathed Joyce in preparation for this book, and you can tell just by looking at the rather extensive bibliography she cites. For this book, artist Bryan Talbot has chosen a very minimalist approach, with a drawing style that shifts subtly as the story moves back and forth through time: from swinging Paris of the 30s, to gritty postwar Britain, to modern times, and back again. As we shift through time, the color schemes change from vintage style monochromatic washes to solid flat colors in a wide spectrum, and everything in between. Fans familiar with Ms. Talbot’s other works may find the art of Dotter of Her Father’s Eyes to be simpler than they might expect, but as a storyteller he delivers a clear concise narrative that succeeds very well for the story. The whole work is equal parts historical exploration and personal introspection. From a grown woman’s perspective Ms. Talbot expresses both fondness and remorse, and has moments of bitterness where she laments her young pursuits to gain her father’s attention, and later her impulse to reject the same. 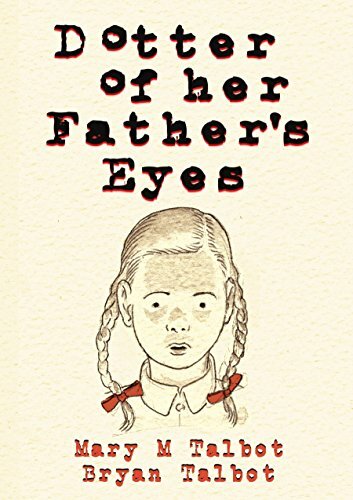 But at its heart, Dotter of Her Father’s Eyes is something of a love letter to both Joyce and to her father—though a bit grudgingly toward both—and for a person with her credentials to fully embrace the graphic novel format, it can be viewed as a love letter to the medium as literature.